EditPad Pro has the capability to run any external command or tool. A tool can be any executable program or application, a script run by an interpreter, or even a URL. To configure tools, select Configure Tools in the Tools menu. The tool configuration screen will appear. The screen is divided into two parts. At the left hand, you'll see a list of currently defined tools. If you haven't defined any tools yet, this list will be empty. At the right hand are three tabs that hold the settings for the tool that's currently selected in the list at the left. The tabs don't appear until you've added at least one tool. To change a tool's settings, simply click on it in the list and make the changes you want. To create a new tool, click the New button below the list and set the options as you want them. To delete a tool, click on it and click the Delete button. The order of the tools in the list is the order in which they will be shown in the Tools menu. Select a tool and click the Up or Down button to move it. You can select multiple tools by holding down the Shift or Control key on the keyboard while clicking in the list of tools. The controls under the tabs will indicate the settings for all tools. If an edit box or drop-down list shows a value, that means all the selected tools use the same value. Otherwise, the edit box will be blank. If a checkbox is checked or cleared, that means it is checked or cleared for all the selected tools. Otherwise, the checkbox will be filled with a square. If you make a change to any setting, that change is applied to all the selected tools. 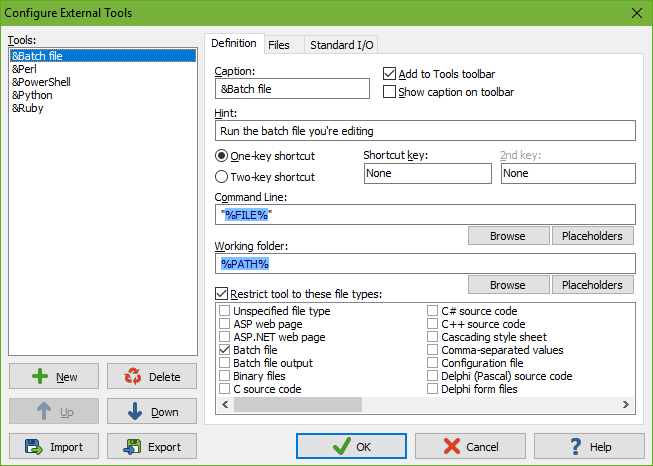 You can save tool configurations into a file that you can share with other people. To save one or more tools, select them in the list and click the Export button below the list. You'll be asked for a name of the .ini file into which all the tools will be saved. To load a tool configuration file you've received from somebody, click the Import button. The loaded tools will be added to the list. Definition: Basic settings you need to make for every tool, so EditPad Pro knows which tool to run. Files: Options for opening and saving files to be passed on the tool's command line. Standard I/O: Options for transferring text to and from console applications. Console applications are applications that use a textual interface or DOS box rather than a graphical interface like EditPad Pro.